While marine pollution can be obvious, as with the marine debris shown above, it is often the pollutants that cannot be seen that cause most harm. Marine pollution occurs when harmful effects result from the entry into the ocean of chemicals, particles, industrial, agricultural, and residential waste, noise, or the spread of invasive organisms. Eighty percent of marine pollution comes from land. Air pollution is also a contributing factor by carrying off pesticides or dirt into the ocean. Land and air pollution have proven to be harmful to marine life and its habitats. The pollution often comes from nonpoint sources such as agricultural runoff, wind-blown debris, and dust. Nutrient pollution, a form of water pollution, refers to contamination by excessive inputs of nutrients. It is a primary cause of eutrophication of surface waters, in which excess nutrients, usually nitrates or phosphates, stimulate algae growth. Many potentially toxic chemicals adhere to tiny particles which are then taken up by plankton and benthic animals, most of which are either deposit feeders or filter feeders. In this way, the toxins are concentrated upward within ocean food chains. Many particles combine chemically in a manner highly depletive of oxygen, causing estuaries to become anoxic. When pesticides are incorporated into the marine ecosystem, they quickly become absorbed into marine food webs. Once in the food webs, these pesticides can cause mutations, as well as diseases, which can be harmful to humans as well as the entire food web. Toxic metals can also be introduced into marine food webs. These can cause a change to tissue matter, biochemistry, behaviour, reproduction, and suppress growth in marine life. Also, many animal feeds have a high fish meal or fish hydrolysate content. In this way, marine toxins can be transferred to land animals, and appear later in meat and dairy products. In order to protect the ocean from marine pollution, policies have been developed internationally. There are different ways for the ocean to get polluted, therefore there have been multiple laws, policies, and treaties put into place throughout history. Although marine pollution has a long history, significant international laws to counter it were not enacted until the twentieth century. Marine pollution was a concern during several United Nations Conventions on the Law of the Sea beginning in the 1950s. Most scientists believed that the oceans were so vast that they had unlimited ability to dilute, and thus render pollution harmless. In the late 1950s and early 1960s, there were several controversies about dumping radioactive waste off the coasts of the United States by companies licensed by the Atomic Energy Commission, into the Irish Sea from the British reprocessing facility at Windscale, and into the Mediterranean Sea by the French Commissariat à l'Energie Atomique. After the Mediterranean Sea controversy, for example, Jacques Cousteau became a worldwide figure in the campaign to stop marine pollution. Marine pollution made further international headlines after the 1967 crash of the oil tanker Torrey Canyon, and after the 1969 Santa Barbara oil spill off the coast of California. Marine pollution was a major area of discussion during the 1972 United Nations Conference on the Human Environment, held in Stockholm. That year also saw the signing of the Convention on the Prevention of Marine Pollution by Dumping of Wastes and Other Matter, sometimes called the London Convention. The London Convention did not ban marine pollution, but it established black and gray lists for substances to be banned (black) or regulated by national authorities (gray). Cyanide and high-level radioactive waste, for example, were put on the black list. The London Convention applied only to waste dumped from ships, and thus did nothing to regulate waste discharged as liquids from pipelines. There are many ways to categorize and examine the inputs of pollution into our marine ecosystems. Patin (n.d.) notes that generally there are three main types of inputs of pollution into the ocean: direct discharge of waste into the oceans, runoff into the waters due to rain, and pollutants released from the atmosphere. One common path of entry by contaminants to the sea are rivers. The evaporation of water from oceans exceeds precipitation. The balance is restored by rain over the continents entering rivers and then being returned to the sea. The Hudson in New York State and the Raritan in New Jersey, which empty at the northern and southern ends of Staten Island, are a source of mercury contamination of zooplankton (copepods) in the open ocean. The highest concentration in the filter-feeding copepods is not at the mouths of these rivers but 70 miles (110 km) south, nearer Atlantic City, because water flows close to the coast. It takes a few days before toxins are taken up by the plankton. Pollution is often classed as point source or nonpoint source pollution. Point source pollution occurs when there is a single, identifiable, localized source of the pollution. An example is directly discharging sewage and industrial waste into the ocean. Pollution such as this occurs particularly in developing nations. Nonpoint source pollution occurs when the pollution comes from ill-defined and diffuse sources. These can be difficult to regulate. Agricultural runoff and wind blown debris are prime examples. Acid mine drainage in the Rio Tinto River. Pollutants enter rivers and the sea directly from urban sewerage and industrial waste discharges, sometimes in the form of hazardous and toxic wastes. Inland mining for copper, gold, etc., is another source of marine pollution. Most of the pollution is simply soil, which ends up in rivers flowing to the sea. However, some minerals discharged in the course of the mining can cause problems, such as copper, a common industrial pollutant, which can interfere with the life history and development of coral polyps. Mining has a poor environmental track record. 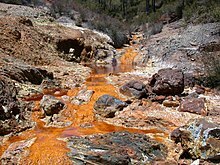 For example, according to the United States Environmental Protection Agency, mining has contaminated portions of the headwaters of over 40% of watersheds in the western continental US. Much of this pollution finishes up in the sea. Surface runoff from farming, as well as urban runoff and runoff from the construction of roads, buildings, ports, channels, and harbours, can carry soil and particles laden with carbon, nitrogen, phosphorus, and minerals. This nutrient-rich water can cause fleshy algae and phytoplankton to thrive in coastal areas; known as algal blooms, which have the potential to create hypoxic conditions by using all available oxygen. In the coast of southwest Florida, harmful algal blooms have existed for over 100 years. These algal blooms have been a cause of species of fish, turtles, dolphins, and shrimp to die and cause harmful effects on humans who swim in the water. Polluted runoff from roads and highways can be a significant source of water pollution in coastal areas. About 75% of the toxic chemicals that flow into Puget Sound are carried by stormwater that runs off paved roads and driveways, rooftops, yards and other developed land. In California, there are many rainstorms that runoff into the ocean. These rainstorms occur from October to March, and these runoff waters contain petroleum, heavy metals, pollutants from emissions, etc. In China, there is a large coastal population that pollutes the ocean through land runoff. This includes sewage discharge and pollution from urbanization and land use. In 2001, more than 66,795 mi² of the Chinese coastal ocean waters were rated less than Class I of the Sea Water Quality Standard of China. Much of this pollution came from Ag, Cu, Cd, Pb, As, DDT, PCBs, etc., which occurred from contamination through land runoff. 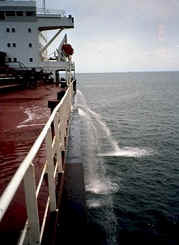 A cargo ship pumps ballast water over the side. Discharge of cargo residues from bulk carriers can pollute ports, waterways, and oceans. In many instances vessels intentionally discharge illegal wastes despite foreign and domestic regulation prohibiting such actions. An absence of national standards provides an incentive for some cruise liners to dump waste in places where the penalties are inadequate. It has been estimated that container ships lose over 10,000 containers at sea each year (usually during storms). Ships also create noise pollution that disturbs natural wildlife, and water from ballast tanks can spread harmful algae and other invasive species. Ballast water taken up at sea and released in port is a major source of unwanted exotic marine life. The invasive freshwater zebra mussels, native to the Black, Caspian, and Azov seas, were probably transported to the Great Lakes via ballast water from a transoceanic vessel. Meinesz believes that one of the worst cases of a single invasive species causing harm to an ecosystem can be attributed to a seemingly harmless jellyfish. Mnemiopsis leidyi, a species of comb jellyfish that spread so it now inhabits estuaries in many parts of the world. It was first introduced in 1982, and thought to have been transported to the Black Sea in a ship's ballast water. The population of the jellyfish grew exponentially and, by 1988, it was wreaking havoc upon the local fishing industry. "The anchovy catch fell from 204,000 tons in 1984 to 200 tons in 1993; sprat from 24,600 tons in 1984 to 12,000 tons in 1993; horse mackerel from 4,000 tons in 1984 to zero in 1993." Now that the jellyfish have exhausted the zooplankton, including fish larvae, their numbers have fallen dramatically, yet they continue to maintain a stranglehold on the ecosystem. Invasive species can take over once occupied areas, facilitate the spread of new diseases, introduce new genetic material, alter underwater seascapes, and jeopardize the ability of native species to obtain food. Invasive species are responsible for about $138 billion annually in lost revenue and management costs in the US alone. A graph linking atmospheric dust to various coral deaths across the Caribbean Sea and Florida. Another pathway of pollution occurs through the atmosphere. Wind-blown dust and debris, including plastic bags, are blown seaward from landfills and other areas. Dust from the Sahara moving around the southern periphery of the subtropical ridge moves into the Caribbean and Florida during the warm season as the ridge builds and moves northward through the subtropical Atlantic. Dust can also be attributed to a global transport from the Gobi and Taklamakan deserts across Korea, Japan, and the Northern Pacific to the Hawaiian Islands. Since 1970, dust outbreaks have worsened due to periods of drought in Africa. There is a large variability in dust transport to the Caribbean and Florida from year to year; however, the flux is greater during positive phases of the North Atlantic Oscillation. The USGS links dust events to a decline in the health of coral reefs across the Caribbean and Florida, primarily since the 1970s. Climate change is raising ocean temperatures and raising levels of carbon dioxide in the atmosphere. These rising levels of carbon dioxide are acidifying the oceans. This, in turn, is altering aquatic ecosystems and modifying fish distributions, with impacts on the sustainability of fisheries and the livelihoods of the communities that depend on them. Healthy ocean ecosystems are also important for the mitigation of climate change. Because deep sea mining is a relatively new field, the complete consequences of full-scale mining operations are unknown. However, experts are certain that removal of parts of the sea floor will result in disturbances to the benthic layer, increased toxicity of the water column, and sediment plumes from tailings. Removing parts of the sea floor disturbs the habitat of benthic organisms, possibly, depending on the type of mining and location, causing permanent disturbances. Aside from direct impact of mining the area, leakage, spills, and corrosion would alter the mining area's chemical makeup. Among the impacts of deep sea mining, sediment plumes could have the greatest impact. Plumes are caused when the tailings from mining (usually fine particles) are dumped back into the ocean, creating a cloud of particles floating in the water. Two types of plumes occur: near-bottom plumes and surface plumes. Near-bottom plumes occur when the tailings are pumped back down to the mining site. The floating particles increase the turbidity, or cloudiness, of the water, clogging filter-feeding apparatuses used by benthic organisms. Surface plumes cause a more serious problem. Depending on the size of the particles and water currents the plumes could spread over vast areas. The plumes could impact zooplankton and light penetration, in turn affecting the food web of the area. 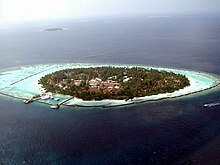 An island with a fringing reef in the Maldives. Coral reefs are dying around the world. The oceans are normally a natural carbon sink, absorbing carbon dioxide from the atmosphere. Because the levels of atmospheric carbon dioxide are increasing, the oceans are becoming more acidic. The potential consequences of ocean acidification are not fully understood, but there are concerns that structures made of calcium carbonate may become vulnerable to dissolution, affecting corals and the ability of shellfish to form shells. Oceans and coastal ecosystems play an important role in the global carbon cycle and have removed about 25% of the carbon dioxide emitted by human activities between 2000 and 2007 and about half the anthropogenic CO2 released since the start of the industrial revolution. Rising ocean temperatures and ocean acidification means that the capacity of the ocean carbon sink will gradually get weaker, giving rise to global concerns expressed in the Monaco and Manado Declarations. A report from NOAA scientists published in the journal Science in May 2008 found that large amounts of relatively acidified water are upwelling to within four miles of the Pacific continental shelf area of North America. This area is a critical zone where most local marine life lives or is born. While the paper dealt only with areas from Vancouver to northern California, other continental shelf areas may be experiencing similar effects. A related issue is the methane clathrate reservoirs found under sediments on the ocean floors. These trap large amounts of the greenhouse gas methane, which ocean warming has the potential to release. In 2004 the global inventory of ocean methane clathrates was estimated to occupy between one and five million cubic kilometres. If all these clathrates were to be spread uniformly across the ocean floor, this would translate to a thickness between three and fourteen metres. This estimate corresponds to 500–2500 gigatonnes carbon (Gt C), and can be compared with the 5000 Gt C estimated for all other fossil fuel reserves. The effect of eutrophication on marine benthic life. Eutrophication is an increase in chemical nutrients, typically compounds containing nitrogen or phosphorus, in an ecosystem. It can result in an increase in the ecosystem's primary productivity (excessive plant growth and decay), and further effects including lack of oxygen and severe reductions in water quality, fish, and other animal populations. The biggest culprit are rivers that empty into the ocean, and with it the many chemicals used as fertilizers in agriculture as well as waste from livestock and humans. An excess of oxygen-depleting chemicals in the water can lead to hypoxia and the creation of a dead zone. Estuaries tend to be naturally eutrophic because land-derived nutrients are concentrated where runoff enters the marine environment in a confined channel. The World Resources Institute has identified 375 hypoxic coastal zones around the world, concentrated in coastal areas in Western Europe, the Eastern and Southern coasts of the US, and East Asia, particularly in Japan. In the ocean, there are frequent red tide algae blooms that kill fish and marine mammals and cause respiratory problems in humans and some domestic animals when the blooms reach close to shore. In addition to land runoff, atmospheric anthropogenic fixed nitrogen can enter the open ocean. A study in 2008 found that this could account for around one third of the ocean's external (non-recycled) nitrogen supply and up to three per cent of the annual new marine biological production. It has been suggested that accumulating reactive nitrogen in the environment may have consequences as serious as putting carbon dioxide in the atmosphere. One proposed solution to eutrophication in estuaries is to restore shellfish populations, such as oysters. Oyster reefs remove nitrogen from the water column and filter out suspended solids, subsequently reducing the likelihood or extent of harmful algal blooms or anoxic conditions. Filter feeding activity is considered beneficial to water quality by controlling phytoplankton density and sequestering nutrients, which can be removed from the system through shellfish harvest, buried in the sediments, or lost through denitrification. Foundational work toward the idea of improving marine water quality through shellfish cultivation to was conducted by Odd Lindahl et al., using mussels in Sweden. A mute swan builds a nest using plastic garbage. Marine debris is mainly discarded human rubbish which floats on, or is suspended in the ocean. Eighty percent of marine debris is plastic – a component that has been rapidly accumulating since the end of World War II. The mass of plastic in the oceans may be as high as 100,000,000 tonnes (98,000,000 long tons; 110,000,000 short tons). Discarded plastic bags, six pack rings, cigarette butts and other forms of plastic waste which finish up in the ocean present dangers to wildlife and fisheries. Aquatic life can be threatened through entanglement, suffocation, and ingestion.Fishing nets, usually made of plastic, can be left or lost in the ocean by fishermen. Known as ghost nets, these entangle fish, dolphins, sea turtles, sharks, dugongs, crocodiles, seabirds, crabs, and other creatures, restricting movement, causing starvation, laceration, infection, and, in those that need to return to the surface to breathe, suffocation. The remains of an albatross containing ingested flotsam. Many animals that live on or in the sea consume flotsam by mistake, as it often looks similar to their natural prey. Plastic debris, when bulky or tangled, is difficult to pass, and may become permanently lodged in the digestive tracts of these animals. Especially when evolutionary adaptions make it impossible for the likes of turtles to reject plastic bags, which resemble jellyfish when immersed in water, as they have a system in their throat to stop slippery foods from otherwise escaping. Thereby blocking the passage of food and causing death through starvation or infection. Plastics accumulate because they don't biodegrade in the way many other substances do. They will photodegrade on exposure to the sun, but they do so properly only under dry conditions, and water inhibits this process. In marine environments, photodegraded plastic disintegrates into ever-smaller pieces while remaining polymers, even down to the molecular level. When floating plastic particles photodegrade down to zooplankton sizes, jellyfish attempt to consume them, and in this way the plastic enters the ocean food chain. Many of these long-lasting pieces end up in the stomachs of marine birds and animals, including sea turtles, and black-footed albatross. In a 2008 Pacific Gyre voyage, Algalita Marine Research Foundation researchers began finding that fish are ingesting plastic fragments and debris. Of the 672 fish caught during that voyage, 35% had ingested plastic pieces. Plastic debris tends to accumulate at the centre of ocean gyres. The North Pacific Gyre, for example, has collected the so-called "Great Pacific Garbage Patch", which is now estimated to be one to twenty times the size of Texas (approximately from 700,000 to 15,000,000 square kilometers). There could be as much plastic as fish in the sea. It has a very high level of plastic particulate suspended in the upper water column. In samples taken in 1999, the mass of plastic exceeded that of zooplankton (the dominant animal life in the area) by a factor of six. Midway Atoll, in common with all the Hawaiian Islands, receives substantial amounts of debris from the garbage patch. Ninety percent plastic, this debris accumulates on the beaches of Midway where it becomes a hazard to the bird population of the island. Midway Atoll is home to two-thirds (1.5 million) of the global population of Laysan albatross. Nearly all of these albatross have plastic in their digestive system and one-third of their chicks die. Toxic additives used in the manufacture of plastic materials can leach out into their surroundings when exposed to water. Waterborne hydrophobic pollutants collect and magnify on the surface of plastic debris, thus making plastic far more deadly in the ocean than it would be on land. Hydrophobic contaminants are also known to bioaccumulate in fatty tissues, biomagnifying up the food chain and putting pressure on apex predators. Some plastic additives are known to disrupt the endocrine system when consumed, others can suppress the immune system or decrease reproductive rates. Floating debris can also absorb persistent organic pollutants from seawater, including PCBs, DDT, and PAHs. Aside from toxic effects, when ingested some of these affect animal brain cells similarly to estradiol, causing hormone disruption in the affected wildlife. Saido, a chemist with the College of Pharmacy, conducted a study in Nihon University, Chiba, Japan, that discovered, when plastics eventually decompose, they produce potentially toxic bisphenol A (BPA) and PS oligomer into the water. These toxins are believed to bring harm to the marine life living in the area. A growing concern regarding plastic pollution in the marine ecosystem is the use of microplastics. Microplastics are little beads of plastic less than 5 millimeters wide, and they are commonly found in hand soaps, face cleansers, and other exfoliators. When these products are used, the microplastics go through the water filtration system and into the ocean, but because of their small size they are likely to escape capture by the preliminary treatment screens on wastewater plants. These beads are harmful to the organisms in the ocean, especially filter feeders, because they can easily ingest the plastic and become sick. The microplastics are such a concern because it is difficult to clean them up due to their size, so humans can try to avoid using these harmful plastics by purchasing products that use environmentally safe exfoliates. Apart from plastics, there are particular problems with other toxins that do not disintegrate rapidly in the marine environment. Examples of persistent toxins are PCBs, DDT, TBT, pesticides, furans, dioxins, phenols, and radioactive waste. Heavy metals are metallic chemical elements that have a relatively high density and are toxic or poisonous at low concentrations. Examples are mercury, lead, nickel, arsenic, and cadmium. Such toxins can accumulate in the tissues of many species of aquatic life in a process called bioaccumulation. They are also known to accumulate in benthic environments, such as estuaries and bay muds: a geological record of human activities of the last century. Chinese and Russian industrial pollution such as phenols and heavy metals in the Amur River have devastated fish stocks and damaged its estuary soil. Wabamun Lake in Alberta, Canada, once the best whitefish lake in the area, now has unacceptable levels of heavy metals in its sediment and fish. Acute and chronic pollution events have been shown to impact southern California kelp forests, though the intensity of the impact seems to depend on both the nature of the contaminants and duration of exposure. Due to their high position in the food chain and the subsequent accumulation of heavy metals from their diet, mercury levels can be high in larger species such as bluefin and albacore. As a result, in March 2004 the United States FDA issued guidelines recommending that pregnant women, nursing mothers and children limit their intake of tuna and other types of predatory fish. Some shellfish and crabs can survive polluted environments, accumulating heavy metals or toxins in their tissues. For example, mitten crabs have a remarkable ability to survive in highly modified aquatic habitats, including polluted waters. The farming and harvesting of such species needs careful management if they are to be used as a food. Surface runoff of pesticides can alter the gender of fish species genetically, transforming male into female fish. Heavy metals enter the environment through oil spills – such as the Prestige oil spill on the Galician coast and Gulf of Mexico which unleashed an estimated 3.19 million barrels of oil – or from other natural or anthropogenic sources. In 2005, the 'Ndrangheta, an Italian mafia syndicate, was accused of sinking at least 30 ships loaded with toxic waste, much of it radioactive. This has led to widespread investigations into radioactive waste disposal rackets. Since the end of World War II, various nations, including the Soviet Union, the United Kingdom, the United States, and Germany, have disposed of chemical weapons in the Baltic Sea, raising concerns of environmental contamination. The damaging of the Fukushima Dai-ichi Nuclear Power Plant in 2011 caused radioactive toxins to leak into the air and ocean. There are still many isotopes in the ocean, which directly affects the benthic food web and also affects the whole food chain. The concentration of 137Cs in the bottom sediment that was contaminated by water with high concentrations in April–May 2011 remains quite high and is showing signs of very slow decrease with time. Marine life can be susceptible to noise or the sound pollution from sources such as passing ships, oil exploration seismic surveys, and naval low-frequency active sonar. Sound travels more rapidly and over larger distances in the sea than in the atmosphere. Marine animals, such as cetaceans, often have weak eyesight, and live in a world largely defined by acoustic information. This applies also to many deeper sea fish, who live in a world of darkness. Between 1950 and 1975, ambient noise at one location in the Pacific Ocean increased by about ten decibels (that is a tenfold increase in intensity). Noise also makes species communicate louder, which is called the Lombard vocal response. Whale songs are longer when submarine-detectors are on. If creatures don't "speak" loud enough, their voice can be masked by anthropogenic sounds. These unheard voices might be warnings, finding of prey, or preparations of net-bubbling. When one species begins speaking louder, it will mask other species voices, causing the whole ecosystem to eventually speak louder. According to the oceanographer Sylvia Earle, "Undersea noise pollution is like the death of a thousand cuts. Each sound in itself may not be a matter of critical concern, but taken all together, the noise from shipping, seismic surveys, and military activity is creating a totally different environment than existed even 50 years ago. That high level of noise is bound to have a hard, sweeping impact on life in the sea." Noise from ships and human activity can damage Cnidarians and Ctenophora, which are very important organisms in the marine ecosystem. They promote high diversity and they are used as models for ecology and biology because of their simple structures. When there is underwater noise, the vibrations in the water damage the cilia hairs in the Coelenterates. In a study, the organisms were exposed to sound waves for different numbers of times and the results showed that damaged hair cells were extruded or missing or presented bent, flaccid or missed kinocilia and stereocilia. Much anthropogenic pollution ends up in the ocean. The 2011 edition of the United Nations Environment Programme Year Book identifies as the main emerging environmental issues the loss to the oceans of massive amounts of phosphorus, "a valuable fertilizer needed to feed a growing global population", and the impact billions of pieces of plastic waste are having globally on the health of marine environments. Bjorn Jennssen (2003) notes in his article, "Anthropogenic pollution may reduce biodiversity and productivity of marine ecosystems, resulting in reduction and depletion of human marine food resources". There are two ways the overall level of this pollution can be mitigated: either the human population is reduced, or a way is found to reduce the ecological footprint left behind by the average human. If the second way is not adopted, then the first way may be imposed as the world ecosystems falter. The second way is for humans, individually, to pollute less. That requires social and political will, together with a shift in awareness so more people respect the environment and are less disposed to abuse it. At an operational level, regulations, and international government participation is needed. It is often very difficult to regulate marine pollution because pollution spreads over international barriers, thus making regulations hard to create as well as enforce. Without appropriate awareness of marine pollution, the necessary global will to effectively address the issues may prove inadequate. Balanced information on the sources and harmful effects of marine pollution need to become part of general public awareness, and ongoing research is required to fully establish, and keep current, the scope of the issues. As expressed in Daoji and Dag's research, one of the reasons why environmental concern is lacking among the Chinese is because the public awareness is low and therefore should be targeted. The amount of awareness on marine pollution is vital to the support of keeping the prevention of trash from entering waterways and ending up in our oceans. The EPA reports that in 2014 Americans generated about 258 million tons of waste, and only a third was recycled or composted. In 2015, there was over 8 million tons of plastic that made it into the ocean. Through more sustainable packing this could lead to; eliminating toxic constituents, using fewer materials, making more readily available recyclable plastic. However, awareness can only take these initiatives so far. The most abundant plastic is PET (Polyethylene terephthalate) and is the most resistant to biodegradables. Researchers have been making great strides in combating this problem. In one way has been by adding a special polymer called a tetrablock copolymer. The tetrablock copolymer acts as a laminate between the PE and iPP which enables for an easier breakdown but still be tough. Through more awareness, individuals will become more cognizant of their carbon footprints. Also, from research and technology, more strides can be made to aid in the plastic pollution problem. In 2018 a survey of Global Oceanic Environmental Survey (GOES) Foundation find that the ecosystem in seas and oceans can collapse in the next 25 years what would fail the terrestrial ecosystem and end the life on earth as we know them. The main causes: Plastic pollution, Ocean acidification, Ocean pollution. For prevent that scenario from happen, we need a total single use plastic ban, ban on wood burning, planting as many trees as possible, " pollution-free recycling of electronics and by 2030 all industries to be zero toxic discharge." "special protection and perservation of peat bogs, wetlands, marshlands and mangrove swamps to ensure carbon dioxide is absorbed from the atmosphere." In 1948, Harry Truman signed a law formerly known as the Federal Water Pollution Control Act that allowed the federal government to control marine pollution in United States of America. In 1972, the Marine Protection, Research, and Sanctuaries Act of 1972 was passed by the Council on Environmental Quality which controls ocean dumping. In 1973 and 1978, MARPOL 73/78 was a treaty written to control vessel pollution, especially regarding oil. In 1983, the International Convention for the Prevention of Pollution from Ships enforced the MARPOL 73/78 treaty internationally. The 1982 United Nations Convention on the Law of the Sea (UNCLOS) was established to protect the marine environment by governing states to control their pollution to the ocean. It put restrictions on the amount of toxins and pollutants that come from all ships internationally. ^ US Department of Commerce, National Oceanic and Atmospheric Administration. "What is the biggest source of pollution in the ocean?". oceanservice.noaa.gov. Retrieved 22 November 2015. ^ Hamblin, Jacob Darwin (2008). Poison in the Well: Radioactive Waste in the Oceans at the Dawn of the Nuclear Age. Rutgers University Press. ISBN 978-0-8135-4220-1. ^ Patin, S.A. "Anthropogenic impact in the sea and marine pollution". offshore-environment.com. Retrieved 1 February 2018. ^ Young, Emma (2003). "Copper decimates coral reef spawning". Retrieved 26 August 2006. ^ Environmental Protection Agency. "Liquid Assets 2000: Americans Pay for Dirty Water". Archived from the original on 15 May 2008. Retrieved 23 January 2007. ^ a b Weis, Judith S.; Butler, Carol A. (2009). Weis, Judith S.; Butler, Carol A. (eds.). Salt Marshes. Salt Marshes. A Natural and Unnatural History. Rutgers University Press. pp. 117–149. ISBN 9780813545486. JSTOR j.ctt5hj4c2.10. ^ "Control of Toxic Chemicals in Puget Sound, Phase 2: Development of Simple Numerical Models". Washington State Department of Ecology. 2008. Archived from the original on 2 March 2017. ^ Holt, Benjamin; Trinh, Rebecca; Gierach, Michelle M. (15 May 2017). "Stormwater runoff plumes in the Southern California Bight: A comparison study with SAR and MODIS imagery". Marine Pollution Bulletin. 118 (1): 141–154. doi:10.1016/j.marpolbul.2017.02.040. PMID 28238485. ^ a b Daoji, Li; Daler, Dag (2004). "Ocean Pollution from Land-Based Sources: East China Sea, China". Ambio. 33 (1/2): 107–113. JSTOR 4315461. ^ Panetta, L.E. (Chair) (2003). America's living oceans: charting a course for sea change (PDF). Pew Oceans Commission. ^ Farmer, Andrew (1997). Managing Environmental Pollution. Psychology Press. ISBN 978-0415145152. ^ Schulkin, A (2002) "Safe Harbours: Creating an International Solution to Cruise Ship Pollution", Georgetown International Environmental Law Review, 15 (1): 105–132. ^ Podsadam, Janice (19 June 2001). "Lost Sea Cargo: Beach Bounty or Junk?". National Geographic News. Retrieved 8 April 2008. ^ Pimentel, D.; Zuniga, R.; Morrison, D. (2005). "Update on the environmental and economic costs associated with alien-invasive species in the United States". Ecological Economics. 52 (3): 273–288. doi:10.1016/j.ecolecon.2004.10.002. ^ Duce, R. A.; Unni, C. K.; Ray, B. J.; Prospero, J. M.; Merrill, J. T. (1980). "Long-Range Atmospheric Transport of Soil Dust from Asia to the Tropical North Pacific: Temporal Variability". Science. 209 (4464): 1522–4. Bibcode:1980Sci...209.1522D. doi:10.1126/science.209.4464.1522. PMID 17745962. ^ Prospero, J. M.; Nees, R. T. (1986). "Impact of the North African drought and El Niño on mineral dust in the Barbados trade winds". Nature. 320 (6064): 735–738. Bibcode:1986Natur.320..735P. doi:10.1038/320735a0. ^ a b c d e Ahnert, A.; Borowski, C. (2000). "Environmental risk assessment of anthropogenic activity in the deep-sea". Journal of Aquatic Ecosystem Stress and Recovery. 7 (4): 299–315. doi:10.1023/A:1009963912171. ^ a b Halfar, J.; Fujita, R. M. (2007). "ECOLOGY: Danger of Deep-Sea Mining". Science. 316 (5827): 987. doi:10.1126/science.1138289. PMID 17510349. ^ Glasby, G. P. (2000). "ECONOMIC GEOLOGY: Lessons Learned from Deep-Sea Mining". Science. 289 (5479): 551–3. doi:10.1126/science.289.5479.551. PMID 17832066. ^ Sharma, R. (2005). "Deep-Sea Impact Experiments and their Future Requirements". Marine Georesources & Geotechnology. 23 (4): 331–338. doi:10.1080/10641190500446698. ^ a b Nath, B. N.; Sharma, R. (2000). "Environment and Deep-Sea Mining: A Perspective". Marine Georesources & Geotechnology. 18 (3): 285–294. doi:10.1080/10641190009353796. ^ Orr, J. C.; Fabry, V. J.; Aumont, O.; Bopp, L.; Doney, S. C.; Feely, R. A.; Gnanadesikan, A.; Gruber, N.; Ishida, A.; Joos, F.; Key, R. M.; Lindsay, K.; Maier-Reimer, E.; Matear, R.; Monfray, P.; Mouchet, A.; Najjar, R. G.; Plattner, G. K.; Rodgers, K. B.; Sabine, C. L.; Sarmiento, J. L.; Schlitzer, R.; Slater, R. D.; Totterdell, I. J.; Weirig, M. F.; Yamanaka, Y.; Yool, A. (2005). "Anthropogenic ocean acidification over the twenty-first century and its impact on calcifying organisms". Nature. 437 (7059): 681–686. Bibcode:2005Natur.437..681O. doi:10.1038/nature04095. PMID 16193043. ^ Key, R. M.; Kozyr, A.; Sabine, C. L.; Lee, K.; Wanninkhof, R.; Bullister, J. L.; Feely, R. A.; Millero, F. J.; Mordy, C.; Peng, T. -H. (2004). "A global ocean carbon climatology: Results from Global Data Analysis Project (GLODAP)". Global Biogeochemical Cycles. 18 (4): n/a. Bibcode:2004GBioC..18.4031K. doi:10.1029/2004GB002247. ^ Feely, R. A.; Sabine, C. L.; Hernandez-Ayon, J. M.; Ianson, D.; Hales, B. (2008). "Evidence for Upwelling of Corrosive "Acidified" Water onto the Continental Shelf". Science. 320 (5882): 1490–2. Bibcode:2008Sci...320.1490F. CiteSeerX 10.1.1.328.3181. doi:10.1126/science.1155676. PMID 18497259. ^ a b Milkov, A. V. (2004). "Global estimates of hydrate-bound gas in marine sediments: How much is really out there?". Earth-Science Reviews. 66 (3–4): 183–197. Bibcode:2004ESRv...66..183M. doi:10.1016/j.earscirev.2003.11.002. ^ "The Gulf of Mexico Dead Zone and Red Tides". Retrieved 27 December 2006. ^ Duce, R. A.; Laroche, J.; Altieri, K.; Arrigo, K. R.; Baker, A. R.; Capone, D. G.; Cornell, S.; Dentener, F.; Galloway, J.; Ganeshram, R. S.; Geider, R. J.; Jickells, T.; Kuypers, M. M.; Langlois, R.; Liss, P. S.; Liu, S. M.; Middelburg, J. J.; Moore, C. M.; Nickovic, S.; Oschlies, A.; Pedersen, T.; Prospero, J.; Schlitzer, R.; Seitzinger, S.; Sorensen, L. L.; Uematsu, M.; Ulloa, O.; Voss, M.; Ward, B.; Zamora, L. (2008). "Impacts of Atmospheric Anthropogenic Nitrogen on the Open Ocean". Science. 320 (5878): 893–7. Bibcode:2008Sci...320..893D. doi:10.1126/science.1150369. PMID 18487184. ^ Newell, R.I.E. ; Cornwell, J.C.; Owens, M.S. (2002). "Influence of simulated bivalve biodepositon and microphytobenthos on sediment nitrogen dynamics, a laboratory study". Limnology & Oceanography. 47 (5): 1367–1379. Bibcode:2002LimOc..47.1367N. doi:10.4319/lo.2002.47.5.1367. ^ a b c Weisman, Alan (2007). The World Without Us. St. Martin's Thomas Dunne Books. ISBN 978-0-312-34729-1. ^ a b "Plastic Debris: from Rivers to Sea" (PDF). Algalita Marine Research Foundation. Archived from the original (PDF) on 19 August 2008. Retrieved 29 May 2008. ^ "'Ghost fishing' killing seabirds". BBC News. 28 June 2007. ^ Weiss, Kenneth R. (2 August 2006). "Plague of Plastic Chokes the Seas". Los Angeles Times. Archived from the original on 25 March 2008. Retrieved 1 April 2008. ^ Venema, Vibeke (17 October 2014). "The Dutch boy mopping up a sea of plastic". BBC. ^ Moore, Charles (November 2003). "Across the Pacific Ocean, plastics, plastics, everywhere". Natural History. Archived from the original on 27 September 2007. Retrieved 5 April 2008. ^ Sheavly, SB & Register, KM (2007). "Marine debris and plastics: Environmental concerns, sources, impacts and solutions". Journal of Polymers & the Environment. 15 (4): 301–305. doi:10.1007/s10924-007-0074-3. ^ Weisman, Alan (Summer 2007). "Polymers Are Forever". Orion magazine. Retrieved 1 July 2008. ^ Thompson, R. C. (2004). "Lost at Sea: Where is All the Plastic?". Science. 304 (5672): 838. doi:10.1126/science.1094559. PMID 15131299. ^ Moore, C. J.; Moore, S. L.; Leecaster, M. K.; Weisberg, S. B. (2001). "A Comparison of Plastic and Plankton in the North Pacific Central Gyre". Marine Pollution Bulletin. 42 (12): 1297–300. doi:10.1016/S0025-326X(01)00114-X. PMID 11827116. ^ Moore, Charles (November 2003). "Across the Pacific Ocean, plastics, plastics, everywhere". Natural History Magazine. Archived from the original on 27 September 2007. ^ "The Problem of Marine Plastic Pollution". Clean Water Action. 20 April 2016. Retrieved 15 June 2018. ^ Seeker (3 December 2018). "The Great Pacific Garbage Patch Is Not What You Think It Is". Seeker. Retrieved 10 December 2018. ^ a b "Plastics and Marine Debris". Algalita Marine Research Foundation. 2006. Retrieved 1 July 2008. ^ "Midway's albatross population stable | Hawaii's Newspaper". The Honolulu Advertiser. 17 January 2005. Retrieved 20 May 2012. ^ Jordan, Chris (11 November 2009). "Midway: Message from the Gyre". Retrieved 13 November 2009. ^ "Q&A: Your Midway questions answered". BBC News. 28 March 2008. Retrieved 12 May 2010. ^ Rios, L. M.; Moore, C.; Jones, P. R. (2007). "Persistent organic pollutants carried by synthetic polymers in the ocean environment". Marine Pollution Bulletin. 54 (8): 1230–7. doi:10.1016/j.marpolbul.2007.03.022. PMID 17532349. ^ Tanabe, S.; Watanabe, M.; Minh, T. B.; Kunisue, T.; Nakanishi, S.; Ono, H.; Tanaka, H. (2004). "PCDDs, PCDFs, and Coplanar PCBs in Albatross from the North Pacific and Southern Oceans: Levels, Patterns, and Toxicological Implications". Environmental Science & Technology. 38 (2): 403–13. Bibcode:2004EnST...38..403T. doi:10.1021/es034966x. PMID 14750714. ^ Bernstein, M. (19 August 2009). "Plastics in oceans decompose, release hazardous chemicals, surprising new study says". www.acs.org. American Chemical Society. ^ Fendall, Lisa S.; Sewell, Mary A. (2009). "Contributing to marine pollution by washing your face: Microplastics in facial cleansers". Marine Pollution Bulletin. 58 (8): 1225–8. doi:10.1016/j.marpolbul.2009.04.025. PMID 19481226. ^ Grigg, R.W. ; Kiwala, R.S. (1970). "Some ecological effects of discharged wastes on marine life". California Department of Fish and Game. 56: 145–155. ^ Stull, J. K. (1989). "Contaminants in Sediments Near a Major Marine Outfall: History, Effects, and Future". Proceedings OCEANS. 2. pp. 481–484. doi:10.1109/OCEANS.1989.586780. ^ North, W. J.; James, D. E.; Jones, L. G. (1993). "History of kelp beds (Macrocystis) in Orange and San Diego Counties, California". Fourteenth International Seaweed Symposium. p. 277. doi:10.1007/978-94-011-1998-6_33. ISBN 978-94-010-4882-8. ^ Tegner, M. J.; Dayton, P. K.; Edwards, P. B.; Riser, K. L.; Chadwick, D. B.; Dean, T. A.; Deysher, L. (1995). "Effects of a large sewage spill on a kelp forest community: Catastrophe or disturbance?". Marine Environmental Research. 40 (2): 181–224. doi:10.1016/0141-1136(94)00008-D.
^ "What You Need to Know About Mercury in Fish and Shellfish". March 2004. Archived from the original on 19 May 2007. Retrieved 19 May 2007. ^ Gollasch, Stephen (3 March 2006). "Ecology of Eriocheir sinensis". ^ Hui, C. (2005). "Mercury burdens in Chinese mitten crabs (Eriocheir sinensis) in three tributaries of southern San Francisco Bay, California, USA". Environmental Pollution. 133 (3): 481–7. doi:10.1016/j.envpol.2004.06.019. PMID 15519723. ^ Silvestre, F.; Trausch, G.; Péqueux, A.; Devos, P. (2004). "Uptake of cadmium through isolated perfused gills of the Chinese mitten crab, Eriocheir sinensis". Comparative Biochemistry and Physiology A. 137: 189–196. doi:10.1016/S1095-6433(03)00290-3. ^ Initiative, The Ocean Portal Team; Reviewed by the Gulf of Mexico Research. "Gulf Oil Spill". Smithsonian Ocean. Retrieved 10 December 2018. ^ Fristrup, K. M.; Hatch, L. T.; Clark, C. W. (2003). "Variation in humpback whale (Megaptera novaeangliae) song length in relation to low-frequency sound broadcasts". The Journal of the Acoustical Society of America. 113 (6): 3411–24. Bibcode:2003ASAJ..113.3411F. doi:10.1121/1.1573637. PMID 12822811. ^ Jenssen, BM (2003). "Marine pollution: the future challenge is to link human and wildlife studies". Environ Health Perspect. 111 (4): A198–A199. doi:10.1289/ehp.111-a198. PMC 1241462. PMID 12676633. ^ Kullenberg, G. (1999). "Approaches to addressing the problems of pollution of the marine environment: An overview". Ocean & Coastal Management. 42 (12): 999–1018. doi:10.1016/S0964-5691(99)00059-9. ^ Matthews, G. (1973). "Pollution of the oceans: An international problem?". Ocean Management. 1: 161–170. doi:10.1016/0302-184X(73)90010-3. ^ Dryden, Howard. "We have 10 years to save the seas» While in Canada, plankton has declined by half, a Scottish researcher warns of the collapse of the oceans. The consequences would be dramatiс". Global Oceanic Environmental Survey. Retrieved 8 January 2019. ^ MURRAY, PAULA (23 December 2018). "'We've 10 years to save the seas or life on earth will become impossible'". Express. Retrieved 3 January 2019. ^ Davies, J. Clarence; Mazurek, Jan (4 April 2014). Pollution Control in United States: Evaluating the System. Routledge. ISBN 9781135891664. ^ a b Lang, Gregory E. (1990). "PLASTICS, THE MARINE MENACE: CAUSES AND CURES". Journal of Land Use & Environmental Law. 5 (2): 729–752. JSTOR 42842563. ^ Griffin, Andrew (1994). "MARPOL 73/78 and Vessel Pollution: A Glass Half Full or Half Empty?". Indiana Journal of Global Legal Studies. 1 (2): 489–513. JSTOR 20644564. ^ Darmody, Stephen J. (1995). "The Law of the Sea: A Delicate Balance for Environmental Lawyers". Natural Resources & Environment. 9 (4): 24–27. JSTOR 40923485. Gioia, Rosalinda; Eckhardt, Sabine; Breivik, Knut; Jaward, Foday; Prieto, Ailette; Nizzeto, Luca; Jones, Kevin C. (January 2011). "Evidence for Major Emissions of PCBs in the West African Region". Environmental Science & Technology. 45 (4): 1349–1355. Bibcode:2011EnST...45.1349G. doi:10.1021/es1025239. PMID 21226526. Laws, Edward A. (7 September 2000). Aquatic Pollution: An Introductory Text. ISBN 978-0-471-34875-7.